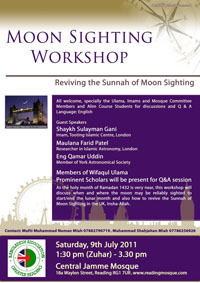 As the holy month of Ramadan 1432 is very near, this workshop will discuss when and where the moon may be reliably sighted to start/end the lunar month and also how to revive the Sunnah of Moon Sighting in the UK, Insha-Allah. All brothers welcome, specially the Ulama, Imams and Mosque Committee Members and Alim Course Students for discussions and questions/answers. Language: English. We held an exclusive Fundraiser Dinner on 8 May 2011 where we have managed to raise an incredible £67,365 including pledges and Karz-e-Hasana! We were just £2,635 short of our £70k target! Jazaak Allah Khair to everyone for their donations and time. More than £55k has already been paid up. 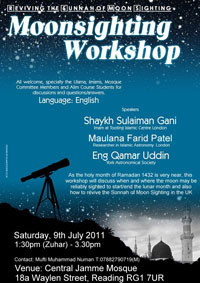 If you have not yet paid or would like to add a further donation, please come and see us in person. Remember we can also donate online at all times!